Everyone knows that when you undergo surgery, there’s always a risk. Thankfully, if you have missing teeth and are facing oral surgery to receive dental implants, you have a very high success rate with minimal risk—up to 98% success to be exact! With those odds, your dentist is excited to explain why you should consider getting dental implants in Sunnyvale and all the benefits they can give you. If you have missing teeth, you probably know that dental implants are one of the best solutions for tooth loss. They provide a permanent solution to tooth loss by anchoring your replacement tooth with biocompatible implant posts. Since these implant posts are surgically placed into your jaw, they provide a long-lasting, natural replacement to critical tooth roots that will provide newfound stability for your smile. How can you guarantee a successful implant placement to maximize your dental implant benefits? The answer is taking proper care of your smile during the healing period. 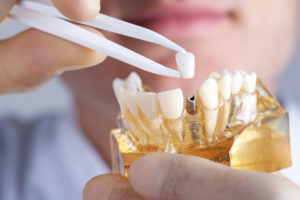 Your mouth will undergo a time classified as osseointegration where the implant will fuse with your jawbone, creating a bond with your dental restoration and the body. This is critical to providing the stability that dental implants are famous for. Do not use any tobacco products as they will slow down the healing process. Properly clean your teeth gently, brushing and flossing all throughout your mouth. Be sure to use an antimicrobial mouthwash to remove potentially infectious materials. If you’re ready to explore the best decision you can make for your oral health, talk to your dentist about revolutionary dental implants. At the office of Dr. George T. Philip, our experienced and friendly team promises to help you create and maintain a smile that is better than what nature gave you. If you have missing teeth, that may sound too good to be true, but you can trust with our advanced training, high-quality resources, and commitment to excellent dental care, that you’ll achieve unbelievable results. If you ever have any questions or would like to schedule a consultation with your expert dentist in Sunnyvale, Dr. Philip, feel free to call our office.